Missouri Compromise, THE. In 1817 the inhabitants of the Territory of Missouri petitioned Congress for admission into the Union as a State. A bill was introduced into Congress (Feb. 13, 1819) for that purpose, when James Tallmadge, Jr., of New York, moved to insert a clause prohibiting any further introduction of slaves within its domains, and granting freedom to the children of those already there, on their attaining the age of twenty-five years. This motion brought the slavery question again before Congress most conspicuously. After a three days' vehement debate, it was carried, 87 to 76. As a companion to the Missouri bill, an-other to organize the Territory of Arkansas was introduced (Feb. 16).When it was taken up, John W. Taylor, of New York, moved to add a provision that neither slavery nor involuntary servitude should hereafter be introduced into any part of the Territories of the United States north of lat. 36° 30' N., the northern boundary of the proposed new Territory of Arkansas. Arthur Livermore, of New Hampshire, who had been zealous for the Missouri restrictions, conceived that this proposition had been made " in the true spirit of compromise," but thought that line of division not sufficiently favorable to freedom. 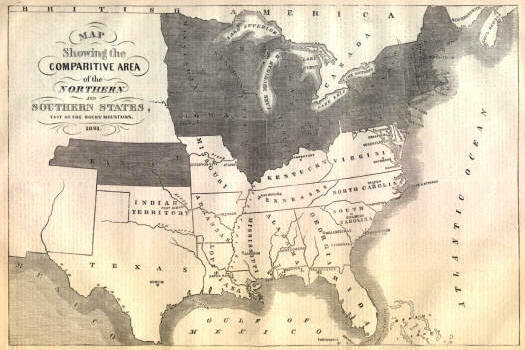 Gen. W. H. Harrison agreed to the necessity of some such partition, but he proposed a line due west from the mouth of the Des Moines River, thus giving up to slavery the State of Missouri and all territory south of that latitude. This partition policy was warmly opposed by a large number of members of Congress from the North and the South, declaring themselves hostile to any compromise whatever. Slavery was either right or wrong, and there could be no compromise. Taylor withdrew his motion. The proposition for a compromise which was finally agreed to was originated by a Northern member, and not by Henry Clay, of Kentucky, as is generally supposed. This Missouri bill caused one of the most exciting debates on the slavery question ever before known in the national legislature. Extreme doctrines and foolish threats were uttered on both sides. Southern members threatened a dissolution of the Union. There was much adroit management by the party leaders, who used great dexterity in trying to avoid a compromise—for one party insisted upon Missouri entering, if at all, as a free-labor State, and the other party insisted that it should enter as a slave-labor State. But compromise seemed to be the only door through which Missouri might enter; and, by adroit management, a compromise bill was carried, March 2, 1820, by a vote of 134 against 42. John Randolph denounced it as " a dirty bargain," and the eighteen Northern men who voted for it as " dough-faces." There was an almost solid North against admitting Missouri as a slave-labor State. President Monroe consulted his cabinet concerning the constitutionality of the act. The matter was allowed to go over until the next session, and it occupied much time during that session. At length Henry Clay moved a joint committee (February, 1821) to consider whether or not it was expedient to admit Missouri into the Union; and if not, what provision adapted to her actual condition ought to be made. The motion prevailed—101 to 55—all of the Southern members, excepting Randolph and two or three followers, voting for it. The committee was appointed, and soon reported. The closing decision on the Missouri question was finally reached by the adoption of a compromise, Feb. 27, 1821, substantially as proposed by Taylor, of New York, in 1819—namely, that in all territory north of lat. 36° 30' N. (outside the boundary of the State of Missouri) slavery should not exist, but should be forever prohibited in the region north of that line. But Missouri was admitted as a slave-labor State. In the course of the later debates there was much angry feeling displayed, and unwise men, North and South, uttered the cry of disunion. A member from Georgia said, pathetically, in the course of the debate: " A fire has been kindled which all the waters of the ocean cannot put out, and which only seas of blood can extinguish." The " seas of blood " shed in the Civil War did alone extinguish it. When President Monroe hesitated about signing the Missouri Compromise act, and laid the matter before his cabinet, he submitted two questions to his advisers: Has Congress the power to prohibit slavery in a Territory? and was the term " forever," in the prohibitive clause in the bill, to be understood as referring only to the territorial condition of the district to which it related, or was it an attempt to extend the prohibition of slavery to such States as might be erected therefrom? The cabinet was unanimous in the affirmative on the first question. On the second question, John Quincy Adams (Secretary of State) thought the term meant forever, and not to be limited to the existence of the territorial condition of the district. Others limited it to the territorial condition—a territorial " forever "—and not interfering with the right of any State formed from it to establish or prohibit slavery. Calhoun wished not to have this question mooted, and at his suggestion the second question was modified into the mere inquiry, Is the provision, as it stands in the bill, constitutional or not? This was essentially a different question. To it all could answer yes, and did so answer in writing. This writing was ordered to be deposited in the archives of state, but it afterwards mysteriously disappeared. The act was then signed by the President, but with a different understanding from that which had been adopted by Congress.